Popular singer and movie star Bing Crosby was the host of his own music and variety show. Known for his pleasant personality and his love of jazz, he attracted many talented musicians and singers to his program. He was regularly joined by Victor Borge, Mary Martin, Bob Hope, and Judy Garland. Other musical guests included Duke Ellington, Nat King Cole, Al Jolson, Ethel Merman, and Les Paul. 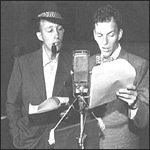 Bing was on the air for almost 15 years, and his show made history in 1946 when it became the first radio program to be pre-recorded for later broadcast.